Let's go to Bali and discover fantastic coffee in Bali. Enjoy a cup of black coffee in paradise. If you are a big fan of coffee, don’t forget to ask for the original coffee of Bali so that you can smell the aroma of coffee growing in this beautiful island. You may frequently visit cafes or coffee shop that serve coffee from Toraja, East Timor, Papua, Ethiopia, Uganda or coffee from the island of Java. Coffee also grows well in Bali, even has a unique flavor. It is not just coffee tree can grow well in the land of Bali, chocolate or cacao trees can also grow with good yields. Even Bali has been a long time exporter of this commodity. If you drink coffee or enjoy a cake or ice cream that uses the scent of vanilla and chocolate in a cafe in Moscow, Paris, New York or Tokyo, then you have to feel a sense of exotic and delicious aroma of chocolate, coffee and vanilla from Bali, a real tropical paradise in the world. If you have ever watched the movie Bucket List, then you'll see a scene and dialogue about the civet coffee in this movie. The film, starring Jack Nicholson and Morgan Freeman is very interesting indeed. 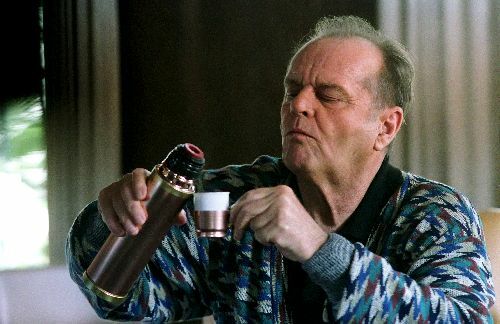 Morgan Freeman and Jack Nicholson did not say Luwak coffee with coffee, but mention the name of coffee in the original language of "Kopi Luwak". You should watch "The Bucket List" movie. It's a fantastic movie. I like this movie. The unique story of this coffee also appeared in an episode of Oprah Winfrey show. Kopi Luwak usually comes from the island of Sumatra. This Coffee is expensive because of the special process by the animal called the civet. The aroma of Kopi Luwak is also very unique addition to exceptional taste. Bali genuine Luwak coffee was also there because of the mountains in Bali this mongoose habitat was living among coffee plantations. Don't forget to visit a beautiful coffee plantation in Kintamani, and you can enjoy organic coffee or Kopi Luwak. The coffee farmers in Bali capture business opportunities from Luwak coffee as happened in Sumatra, so that they now maintain a Lubak (mongoose), they can process Luwak coffee. Formerly called the mongoose or lubak animal is considered a pest, but now these animals are invited as a partner to build the business of coffee by farmers. Is not this a unique collaboration? Coffee break in Kori Ubud, Bali. Apparently Luwak Coffee aroma and taste of Bali has its own uniqueness. This occurs because the climate and soil in Bali is ideal to be planted Arabica and Robusta coffee. The coffee seller is selling only wrote or Arabica Robusta coffee alone or mixed, and some even mix it with a little corn or rice. True coffee fans would rarely want to drink coffees that are mixed with corn or rice. They prefer to coffee the original. If you want to open a coffee shop or cafe, then you can create a new recipe of cappuccino, espresso, ice cream and use original coffee from Bali using a special recipe. Guests will be pleased and surprised. Vacation in Bali will be more complete with a cup of coffee with people you care about or with friends and talk about anything. Coffee can create a lively atmosphere especially a sea breeze at Sanur beach or the cool mountain breeze in Penelokan, Kintamani. 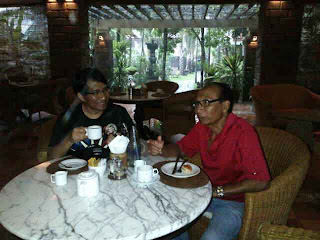 Enjoy lunch or just a coffee break in Bali is a fantastic experience for me (see my photo when we have a coffee break during the rainy day in Kori Ubud, a beautiful hotel in Ubud with my brother in law, Mr. Nyoman Sudhana (with red polo shirt), the owner of Kori Ubud Hotel, Restaurant and Spa. You will more enjoy the coffee with Balinese traditional snacks such as Jaja Lak or pisang goreng (fried banana) . If you back to your country, don’t forget to bring Balinese coffee to your country. Wow ... Surely you will have wonderful memories. Let's join a coffee tour in Bali.